The big news in the laser transfer world is another innovation from Forever, the makers of TransferRIP software. TransferRIP works hand in hand with Forever Laser Dark laser transfer media. Forever Laser Dark is the industry’s most popular and most consistent two-step self-weeding paper for decorating dark garments. Forever Laser Dark comes in three convenient sizes for use in desktop and tabloid laser transfer printers. OKI 711WT owners can choose 8.5” x 11” or 8.5” x 17” sheets. OKI Pro 920 and 8432WT owners can opt for the 11” x 17” tabloid sheets. Until now, the size of the A Foil has been the limiting factor in the size of your transfers. This can be especially frustrating for OKI 711WT users when customers want images bigger than you can print. Not anymore. 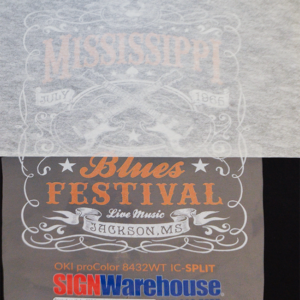 Now with Forever IC-Split, your textile transfers can transcend the boundary of sheet size. First a quick review of Forever TransferRIP is in order. TransferRIP is optional software made specifically for white toner laser transfer printers using the OKI print engine. 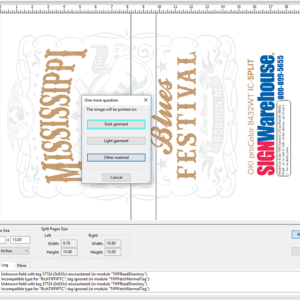 TransferRIP simplifies the white toner design process by enabling users to create dark garment transfers without having to master Adobe Photoshop’s path edit tools. This feature alone can save hours in design time and boost productivity. TransferRIP also includes color management tools that allow you to fine tune your artwork before printing, layout tools that allow you to arrange multiple image files in one design, and a cost calculation module that tells you the total cost of a laser transfer jobs before you print. TransferRIP’s ‘killer app’ is a set of screening options that rasterize image files to reduce toner costs and soften the applied transfer. More about that here. Forever TransferRIP is a time and money-saving upgrade that every OKI WT owner should have. Adding Forever’s new IC-Split software further expands the envelope for impressive profitable textile transfers. 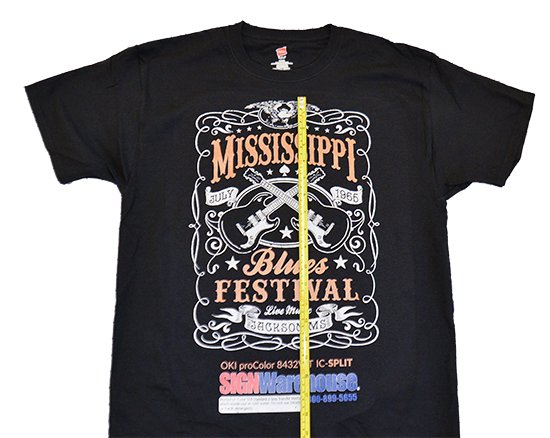 Since Forever IC-Split was created specifically for use with garment decoration, it doesn’t just cut files in half. It analyzes image files and tiles them according to the color content. 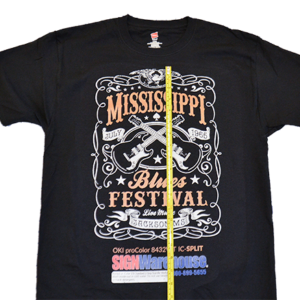 The image separation differs depending on whether you’re going to apply it on a dark or light garment. And it allows for a wide area of overlap in order to hide the tiles for a seamless transfer. And it does all of that in five mouse clicks. That’s the general overview. Here’s a step by step summary of the process. Open IC-Split and browse to an image file. Double-click on the file to add it to the IC-Split workspace. The application supports .png and .tiff files. Determine the desired transfer size (ie. 11 x 17). Rotate the image in the preview window to maximize the tile sizes and make optimal use of the work space. Use the tile border sliders to preview sizes of tiles. Because each page size is displayed as you slide the borders, you can make sure each tile fits on a sheet of transfer paper. The borders overlap. The larger the overlap area, the less visible the seam will be. Click the Split button. A pop-up window asks if the image will be applied to a light or dark surface (Fig 1). This determines where IC-Split places the seams. If preview looks okay, save as. If not, click revert, adjust the sliders and try again. Some images are easier to split than others. Save as a multiple page PDF or a pair of png files. If you choose the png, IC-Split creates two versions of the file labeled L and R (left and right). PDF is simpler because you only have to import one file into TransferRIP, but the .PNG option has an advantage. If you’re working with a complex image, it’s a good idea to open the files in Photoshop or some other graphic design application and position them to make sure the seams match. This is the advantage of the .PNG option. You can manipulate the tiles separately and do a ‘soft proof’ to verify alignment before committing to A Foil. If your tiles align properly, you’re good to go. Open TransferRIP, add the PDF or .PNG files, and process them as you would normally. There are a few other wrinkles in the application process. As is the case with all laser transfer garment decoration products, some of the critical elements are in the application process. 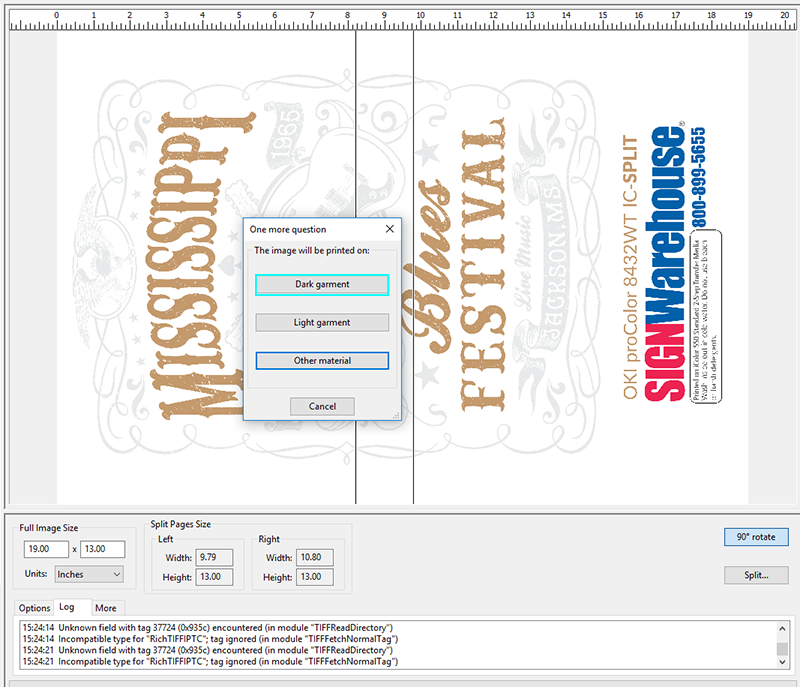 You can get a perfect split from the software and end up with an unusable t-shirt transfer if you botch the application. To save you some head-scratching, here are a few IC-Split application tips. Marry the A-Foil and lo-temp B paper as usual for both tiles; or all three or four if you’re creating a ginormous transfer. The changes come in the second step of the two-step process. When you’re ready for the second step, apply only one tile to the shirt at a time. Don’t press the first tile with the usual amount of high pressure. The official instructions are to use just enough to tack the toner to the shirt. That’s an elusive target. Our testing found that you still need what most would consider ‘medium’ to heavy pressure. Just not as heavy as usual. Peel the first tile cold as usual. Place the next tile on the shirt overlapping the edge of the first tile so that the seams of the toner line up perfectly. Here’s where the transparent A foil sheets become indispensable. 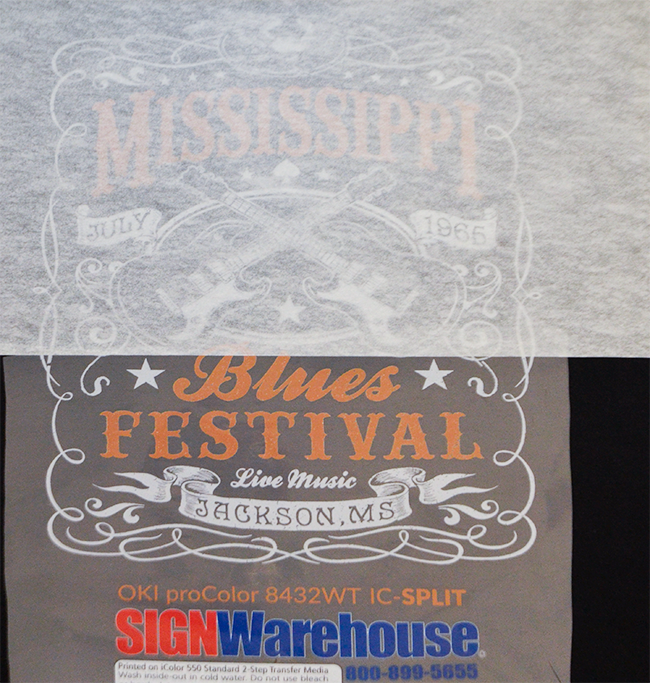 You have to be able to clearly see the toner through the transfer media to make this work. Cover the first tile with silicone Kraft paper or matte finishing paper (Fig 2), and press the second tile at the same reduced pressure. Peel cold. Now you have a perfectly seamed extra large T-shirt transfer. Woot! Cover the entire image with matte finishing paper and press once more with full pressure to fix the toner into the fabric. Wait at least five seconds, remove the paper, lightly stretch the shirt and you’re done. Remember, you’re not limited to two tiles. You can build a Laser Dark jigsaw puzzle and make an XXL sized transfer if you want. But the more tiles you create, the more you risk getting a misaligned seam. And the more time the transfer takes. Charge accordingly or consider buying a bigger printer. Forever IC-Split is a $420 option. If you already have a TransferRIP license, you can purchase the soft key version, download and install it after purchase and start supersizing your transfers right away. You can also use IC-Split without a TransferRIP license, but you’ll need to purchase the hard key version. That one requires a hard key or ‘dongle’ plugged into an open USB port. Although TransferRIP is a Windows only application, IC-Split runs in Mac and Windows OS. It’s compatible with Windows 7,8,10 and Mac OS X 10.10 and higher. You’ll need a 2.5 GHz Intel Core i5 processor, 3.5 GB of RAM, and 2 GB of hard drive storage space.